Here in the US, we opened the year with observations about the volatility and uncertainty surrounding the Chinese economy, and how some companies who manufacture their products in China are starting to worry how it may affect their business. As we have crossed the mid-year point, now's a good time to revisit the pros and cons of manufacturing US goods there. Yes. We all know this one. And, yes, there are probably some instances where, when you factor in shipping and duties, the costs of manufacturing domestically are possibly competitive. But, generally speaking, it's cheaper to manufacture in China (and for a variety of reasons). Not much more needs to be said. Chinese manufacturers are far more likely to give you better service from the outset as a small startup than domestic manufacturers. It is much harder to reach out to US manufacturers, and you can expect calls to remain unanswered. On the other hand, finding a Chinese factory willing to work a smaller company is much easier. The only time a factory will most likely refuse business is if you couldn't meet their high minimum requirements (more on this later in the cons section). 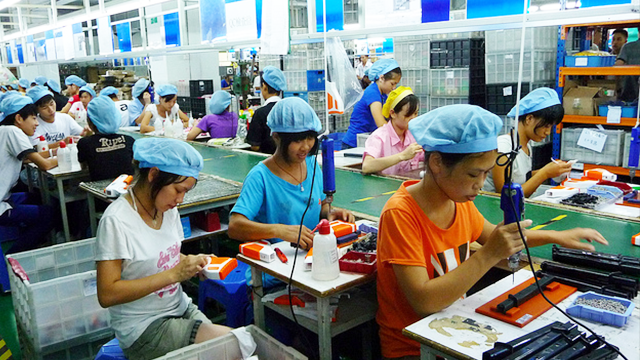 Factories in China are usually able to produce large orders. Most times, when a Chinese factory tells you they can produce your order in four weeks, they produce your order in four weeks. Based on anecdotes shared to Entrepreneur, this isn't necessarily the case in the US. On several occasions, the common complaint is that domestic manufacturing capacity was limited in capacity or time or, at the very least, not nearly as robust as Chinese factories. In China, their quick and aggressive turnaround times are impressive. Some may claim unfair labor treatment as the reason for this, but for those who have actually done business in China before, you know that many (though not all) of the factories indeed operate properly and pay their laborers fair Chinese wages. We’re not here advocating that you copy anyone. In fact, depending on what you're doing, you're more than likely going to find yourself in litigation if you do. But for whatever it is that you're manufacturing, you don't always need to reinvent the wheel, at least for some of it. For example, if you're manufacturing shirts and you like the fit of Shirt Brand ABC, then buying Shirt Brand ABC and asking your Chinese factory to duplicate its dimensions and fit is an easy way to begin your product-building process. Quite frankly, no one does that better than the Chinese. You might want to learn to speak Chenglish (Chinese+English) that hybrid language that you'll have to learn to communicate with your factory. Don't get us wrong. Hats off to the Chinese who have done an incredible job learning English. But they certainly haven't yet mastered it, and, as a result, you'll have to try to deduce what they're talking about at times. But you will. Just remember to use the same words to refer to something as they do. Communication goes beyond language. The Chinese are very precise. They are very literal. They will take very seriously every word you say. So be careful with the words you choose. Use photos to help illustrate your points. Use webcams for meetings when necessary. Make sure you approve each step along the manufacturing process to ensure they are making your products properly. Especially at first. So expect some negative comments and feedback from time to time about the fact that your products are made in China. And learn to ignore them. Chinese factories have far lower profit margins than those in the US. As a result, they are almost never able to accommodate one-offs and, generally speaking, their minimums are often higher than other countries. If the number is so high that you cannot sustain your business manufacturing in China, then you need to consider manufacturing elsewhere. It's that simple. The cost of shipping from a remote city in China (where most factories are) versus the cost of shipping from somewhere in the US will be drastically different. So you'll have to do the math on the "landed cost" (i.e., the final cost of your goods once they have arrived at your front door plus the duty cost you'll pay to the U.S. government) to determine the final price. Then there's the time difference. Shipping by sea takes at least 30 days. Naturally, shipping domestically can literally be one day. So depending on what you're selling, this may make a big deal. And consider the lost sales you'll have during that possible 29-day period when you don't have your goods in stock. Depending on the size of your goods, you may opt to have them shipped by air from China. It's more expensive, but you can get your products at your front door in fewer days. And sometimes, the cost of shipping by air is still less than the lost sales you'd have if you waited the 30-day ocean shipment time. Again, it's all about the math. China gets quite a bad rap for poor quality in manufacturing. Their manufacturing quality is not necessarily any worse (or better) than that in the US. But that all depends on the goods, too. Manufacturing more highly sophisticated goods (say, electronics) can be riskier than something simpler such as textiles. The cost is minimal and the benefits are priceless. Economic or political factors may indeed play a role. Through the years of the US’ Great Recession, we got unexpected price hikes that were caused by anything from currency exchange to the cost of oil. In fact, one year, the Chinese government actually mandated that prices be raised by factories! So expect some of the same if you decide to work with Chinese factories. And while many of the price hikes can be palatable, they'll still throw you off and you may feel blind-sided. Do you really need to quit social media?